In our nearly two months here, I have grown in my dependance upon God's Word. When I wake in the night with anxiety, I have found that meditating on Scripture is the thing that brings me the most peace. The passage that has brought me great comfort recently is Psalm 23. It is a psalm that I memorized as a child, but in these past few years has begun to mean much more to me. Here are some of my thoughts from last night when I woke very anxious. (My anxiety is mostly related to fears about health related issues for my family and me.) I am writing the truths that I am meditating on because I struggle so much to believe. So if this post seems a little preachy, it is because I am needing to preach to myself often these days. My sovereign Lord is taking care of me. He is guiding and leading me. I do not lack anything that He thinks is best for me. He makes me lie down in green pastures; he leads me beside quiet waters, He restores my soul. I can rest peacefully because God is caring for all my needs. I do not need to worry because my Shepherd will take me where I need to go. 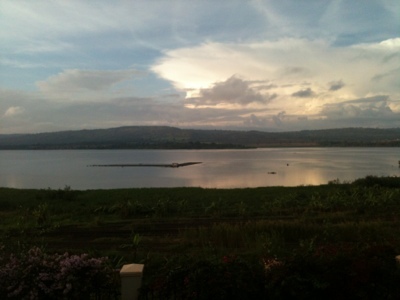 Here is a picture this morning of the quiet waters of the Nile River that I can see from our house. He has led me beside still waters. God is graciously teaching me to trust Him more as I struggle with these anxieties. And he has already given me the righteousness of his Son. By his grace He will help me grow in faith. Even though I walk through the shadow of the valley of death, I will fear no evil. For you are with me. Your rod and your staff, they comfort me. I do not need to live in fear of cancer, malaria, TB, rabies, amoebas, parasites, or anything else, because God is with me. He is able to protect me and my family from all harm. And when he chooses not to do so in this life, through Jesus he has already provided for eternal life in heaven where there is no sickness and nothing to fear! He will be with me either way and through it all. You prepare a table before me in the presence of my enemies. You anoint my head with oil. My cup overflows. God has so graciously blessed us and provided for us. I can thank him for a his gracious blessings. Last night I was specifically thanking him for his financial provision. Surely goodness and mercy will follow me all the days of my life, and I will dwell in the house of The Lord forever! Thanks for sharing, Lisa! Praying for you all!